The Image Library can be used to manage images that you have uploaded for use in symbol grids. To access the Image Library click on the Settings link in the top right corner. You can upload images in the Grid Editor or in the Image Library within settings. Click on the New User Image button. In the dialogue box that pops up click the browse button and locate the images you want to upload. 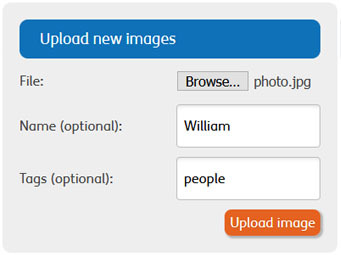 When uploading images you wil be asked to give them a name and assign tags, this is optional but can make images easier to find when searching for them. You can assign multiple tags seperated by commas which can help you organise your image uploads. 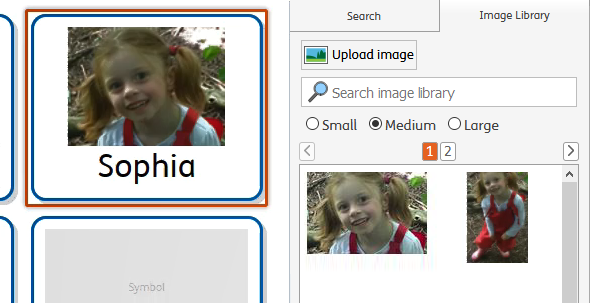 For example if you are uploading pictures of all students in your class you could use tags like Tamsin, Year 1, Class 1b. Uploading Multiple Images: You can select multiple images in the pop up dialog to upload. If you leave the Name blank this will be populated with the image filenames. You can delete a user image by pressing the Delete button. Note: Deleting this image will remove it from all documents that it has been used in. You can Upload replacement images in the Image Library. Click on the image you wish to replace, browse to your new image then click Update user image. Next time you view or edit any document that has this image you will see it has been updated. You can also change the name or tags associted to an image by simply typing new text in the image library. Doing this will replace this image in all documents it has been used in. You can change the orientation of your images in the Image Library using the rotate buttons. Your images can be rotated both clockwise and anticlockwise. If you have added names or tags to your images, you can search for them. This is useful it you have uploaded a lot of images. You can also search for your images using names and tags within the image library panel when you are creating a grid.